Drama students at The Sixth Form College, Solihull spent an afternoon with practitioners from Newman University this week, to develop their A level learning. 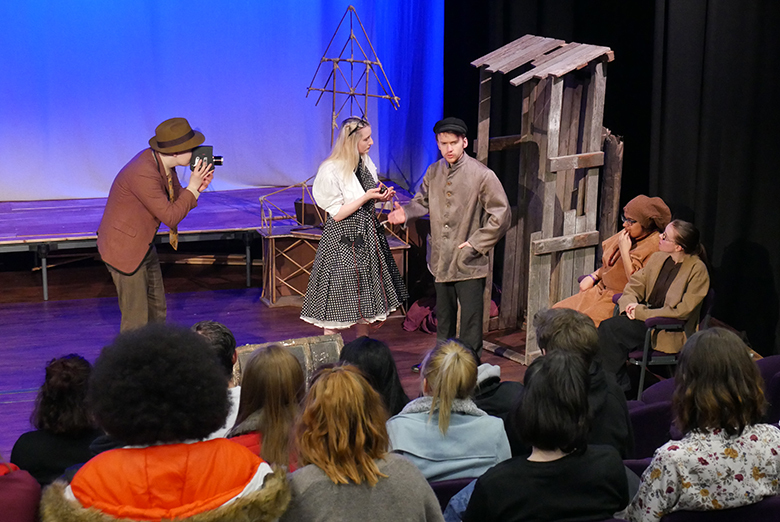 First year Drama & Theatre students watched second year Newman students perform extracts from “The Caucasian Chalk Circle” by German modernist playwright Bertolt Brecht. This followed a workshop with staff and students from Newman, which explored Brecht’s concept of creating a visual picture of what is happening in a scene so the audience can understand what is going on without the need for dialogue. As well as the practical sessions, staff and students from Newman were also on hand to answer the students’ questions about studying Drama at university, including details of the course and the assessment at Newman University. Meanwhile, the Year 13 students are putting on a Drama Showcase on Tuesday 20 March (5.00pm). Tickets are available by contacting the College’s Central Admin Office on 0121 704 2581 or by email. We are fundraising for the Drama department and asking for donations of £4 for adults and £2 for concessions for those wishing to attend.